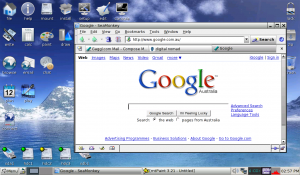 However – in terms of Operating Systems I am now on my 3rd OS (despite initially telling myself that I will stick with the default and avoid tinkering) and it looks like I still have not found what I am looking for. With the XP version of the EEEPC not even on the list of choices because of the sluggish performance on models I tried I survived on the default Xandros install for about 1 month until it’s ‘Easy Interface’ just got too painful in the number of clicks it took to get anywhere. So I changed the Xandros install to ‘Advanced Mode’ which made some things easier, however the lack of any locking mechanism and the fact that installing nearly anything that was not officially supported (via other Debian packages) broke something else, forced me to look for a more standard Linux distro. Eventually I chose Ubuntu for EEE (now called Easy Peasy – ???) As I have started to use Ubuntu on my VMWare desktops for some cloud-app development. The thought of having the same OS on the desktop and netbook had a lot of appeal. Next to CentOS (our Server platform of choice) I don’t want to deal with more distros than absolutely necessary. However in hindsight this turned out to be missing the key differences between both platforms. They are after all very different animals. While it was nice to have the same interface on both Desktop and Netbook, running Ubuntu on the EEE ended up being painfully slow and the WIFI support was pretty ordinary (which is not something I could say about Xandros). Another issue for me was that the support Huawei USB Wireless Modem E220 was sometimes unreliable and took ages to get working. I often had to reboot the machine to get the Wireless modem working again. And time is a very valuable commodity for me these days. Eventually (after some research) I ended up with PuppyLinux and at first glance I have to say it was the fastest user interface I have ever seen on the EEE. There are a few oddities, such as running everything as a privileged user (same as Xandros) and as having Seamonkey as it’s browser instead of Firefox (which is a bit annoying for me as I have a few very useful Firefox add-ons I like on the netbook as well). But at first I thought I have found what I had been looking for. If it wouldn’t be for the problems with network drivers (and how much use is the fastest UI, best functionality without Internet access on a Netbook) I would have dumped all others and stayed with PuppyLinux. Its startup time, speed, no-frills UI is exactly what I need while ‘on the run’. But after a number of hours of tinkering with drivers and various patches reported to work on other EEE versions I gave up. Getting WPA encryption on the WLAN side and the Huawei E220 to work was just too time consuming. Note: I tried to get Puppy 4.12 working. There are some ‘Puplets‘ specificly for EEE’s but mainly for 700 series using and much older codebase . Currently I am (reluctantly) back with Xandros (although the XEPC version of it) and using PuppyLinux as a ‘secondary choice’ from the internal storage drive in the hope the wireless driver problems will be resolved at some stage. I would love to hear from somebody that has it working on the EEE 900 as I really like this puppy. And I’d be even quite happy to donate some dollars for this purpose. And (just in case if Asus is listening and wants some advice) – look at what these guys are doing with Puppy – this is what an alternative Netbook OS should be like – FAST boot, FAST UI, No-frills …. Being out and about a lot, I am a fairly heavy user of my mobile internet plan (currently with Hutchinson 3). One of the more common tasks when there is some down-time while in transit or waiting for coffee is checking out what’s happening in the twittershere. Personally (being a web-app developer for years) I generally prefer browser-based apps over ‘native apps’. Dont even get me started about J2ME apps. One of the main reasons for this preference is that I tend to switch handsets fairly frequently. This makes installing software on phones a large waste of time. Just copying your bookmarks (in my case I have made up my own custom start page on the device) saves a lot of time. 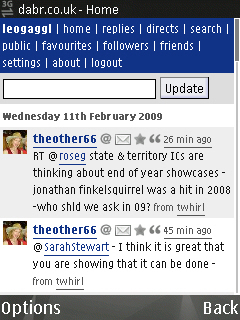 Being Twitter’s very own interface this is probably the one most people start off with. However the functionality of the mobile Twitter client is very limited and after starting to use Twitter more regularily I found the lack of functionality too limiting and started looking for alternatives. 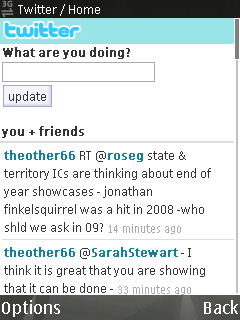 The Slandr interface looked very nice and functionality compared to mobile Twitter was excellent. 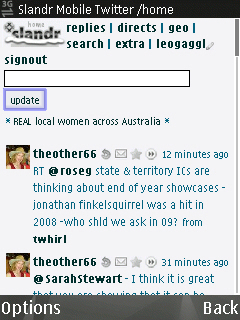 I quite liked the ‘Geo’ function in Slandr, however the annoying adds embedded in content put me off this one. Shortly after trying out Slandr I found this client and this is the one I am now using as my default. I find the interface very clean, the functionality is all I require on the mobile handset and after all it’s an Open Source product which I am happy to support over others. As for the naming of these clients – who comes up with these project names ? Dabr ? Slandr ? Came accross this project recently. Seems like an excellent tool for web meetings. Certainly something that we will give some more attention to as it seems to have some good integration with various products we are using such as Moodle and SugarCRM. After reading an excellent article by Brad Reed on Network World (this seems to be the online version: Co-working: the ultimate in teleworking flexibility),ï¿½I finally got motivated enough to do some more research about thisï¿½phenomenum in the two places of interest to me (Austria and Australia)ï¿½as well as write a quick entry about this. The whole co-working concept has been interesting me ever since it started, but the organisational issues associated with starting such aï¿½venture (and as with everything else – a lack of time) have alwaysï¿½prevented any serious attempt to actually move in this direction. Butï¿½after reading some of the examples in the above mentioned article andï¿½doing some further research I am starting to warm to the idea again. After some quick online research there appears to be some activityï¿½also in Australia although things seem to be still very much in theirï¿½infancy. Most of the activity seems to be happening in Canberra, Perth,ï¿½Syndey and Melbourne (in order of ‘online’ activity). ï¿½Andy Howard inï¿½Sydney has an interesting post on his site andï¿½ fellow software developers describes the situation in Perth and Canberra. It seems (not surprisingly) that most people interested in co-working are in ICT related industries. some resources to get a similar project off the ground please just usï¿½the contact section of this site or leave a comment. The rather unfortunate thing (compared to Europe) is that co-workingï¿½does not even seem to be on the radar for any Government (orï¿½semi-Goverment) Agency involved in the provision of support to emergingï¿½businesses. I have recently visited a coworking space in Austriaï¿½sponsored by the local Chamber of Commerce (Wirtschaftskammer) and Iï¿½found it a rather good investment of funds seeing the activit and buzzï¿½around the place.